I get asked for restaurant recommendations a lot, because people know I love two things: food and traveling! Herewith, I share with you some of my favorite Paris restaurants. 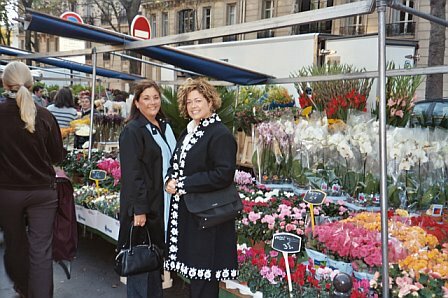 Not a Paris restaurant, but my second favorite thing: a Paris flower market! Most of these bistros are pretty traditional – you got your steak frites, your moules marinieres, your poulet roti and lots of good house wine – but I’ve thrown in a couple more creative / different types, too. Le Petit San Benoit –this place is approximately 1,000 years old – tiny, crowded and utterly French. Pretty simple but fabulous bistro fare – mussels, steak frites, good house red. Tables are so smushed together, you can’t help but make friends with whoever’s next to you. In St. Germain. Au Bon Accueil — amazing bistro food, total charm and the most amazing view of La Tour Eiffel, down the street. We sat outside on the sidewalk (at a table, with chairs, not, like ON the sidewalk … hee hee hee) and had a great meal and good wine. I can’t find a Web site, but the address is 14, rue de Monttessuy, Paris 75007. In the 7th, Trocadero Metro stop. Aux Lyonnais — I tried to get into this place when Alain Ducasse (v. famous French chef, as you may know) opened it back in, like, 2002 or ’03. I finally went a couple years ago. Interesting food, delicious. We had a hilarious time here b/c no one really was into speaking English (like the staff), and my restaurant-French isn’t what it should be. When asking about a certain dish on the menu — Epaulette de something-something – I knew it was shoulder of something – and I accidentally asked if it was shoulder of fish – ahahahahahaa! Big laughing all around. Turns out it was indeed some kind of meat from a little woodlands critter that we don’t have here (probably some kind of fancy French squirrel or something, whatev), so I was excused for not knowing it and I think I ordered it and it was delish. In the Second, Bourse or Richelieu-Drouot metro stop. None of these are outlandishly expensive – just normal Paris expensive (stupid Euro – tho you might thank Greece for dragging the Euro down to a manageable level). Everything’s, like, 20 or 30, 35 Euros per person-ish. Oh, another one that is getting a ton of buzz is Spring — opened, no less, by a Chicago guy (Daniel Rose). The Frenchies are going nuts over it. This is their blog http://springparis.blogspot.com/ I haven’t been, but check it out if you can. Oh, how I love Paris. Bon voyage et bon appetit. I welcome more suggestions! So when I was returning to Chicago from Madrid recently on Iberia Airlines, I had the unique experience of being on the only flight back to the U.S. that was not cancelled due to a two-day planned strike (you know how those Europeans like to announce a planned labor strike). I was prepared for a packed plane as those who were on the cancelled Miami and New York flights tried to cram onto anything that would get them to the U.S. But no! It was empty! Everyone got an empty seat next to them – which was awesome. I can only assume they were all re-booked on other airlines or other days. I asked one of the flight attendants why HE wasn’t on strike and he explained that the Spanish Royal Ministry of Supreme Air Travel or whatever it’s called sets “bare minimums” at which airlines must operate while on strike to avoid being in violation of something or other – and the consequences for that must be serious enough that they obey, keeping one flight open to each country to which Iberia flies (thank God they picked Chicago for the U.S. destination). Since there were no trains running, EVERYONE was in their car on the highways, trying to get to work, school, etc. It was 90 minutes of frustration, but thankfully, I had a good-spirited taxi driver and got to practice my French for an hour and a half. He tried to take every shortcut he could think of and was foiled every time. At one point, snarled just outside the ring road that circles Paris, we sat in a suburban street and he ran into a little shop and returned with two cups of coffee – one for me and one for him. There you have it – live accounts of those famous European super-strikes that I’ve always been curious about. I can only imagine how bummed I’d have been if I’d paid for business or first-class and NOT been treated to the usual glass of Champagne or Cava and the rest of the swank amenities you get up there. I recently spent five days in Madrid, meeting up with a group of friends from various far-flung points around the world (Washington, D.C., Casablanca, Moscow). It was my first foray into Espagne, so I was excited to add a new country to my travel repertoire! Following are some of my favorite – and least favorite things to do, eat, see and watch out for in this historic European capital. Let me just say: it took me three days to rehydrate from the salt overload that came from inhaling ham daily (okay, sometimes twice daily, one day I ate it for breakfast, lunch and dinner – shut up). 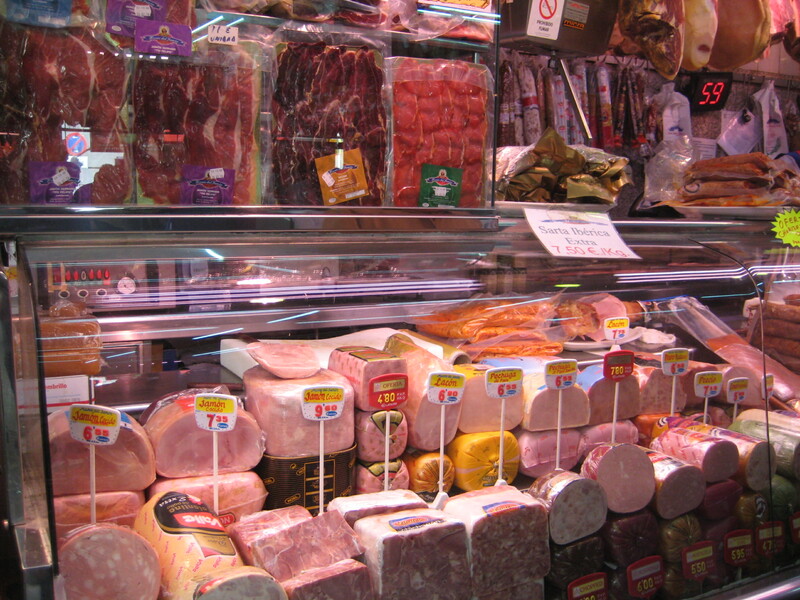 At $100/pound in the U.S., I ate as much Jamon de Iberico as I could in Madrid! 1. La Turuleta in La Latina neighborhood has top-quality tapas in a very cozy, but lively atmosphere. From fried potato strings with a broken fried egg on top to really good salads, everything we tried was amazing. Our party of seven arrived without a reservation at about 9:30 on a Saturday night and had one drink at the bar and were seated – fantastico! The service was great and they even treated us to a complimentary after-dinner liqueur. 2. 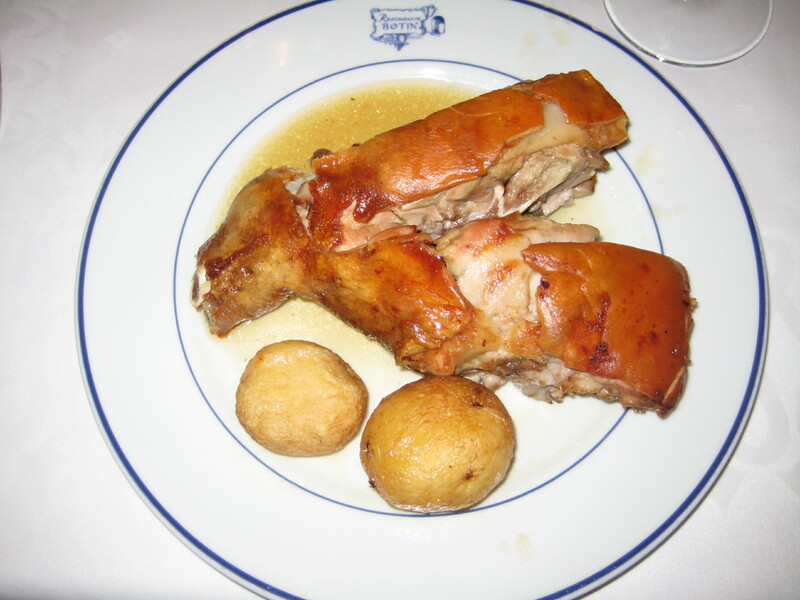 Restaurant Botin – This historic restaurant has been in continuous service since 1725 (and they have a Guinness Book of World Records citation as “World’s Oldest Restaurant”). We thought at first of by-passing it (“Looks touristy.” “After being in business for 284 years, they’re probably just phoning it in, when it comes to the food.”), but don’t! Saturday was a crowded mess, but by lunch time on Tuesday, it was completely manageable. We sampled their famous roast suckling pig and it was AMAZING! Definitely worth the $60 (two course lunch with one glass of wine). Really fun to see the original wood stove and the service was great – they’re happy to show you around – it’s clear they’re really proud of the place after all these years. 3. Vinoteca Barbechera – this upscale wine bar on Plaza Santa Ana had great, modern tapas (oh, that foie gras on the crispy toast… heavenly) and interesting wines by the glass. Right at the corner of Plaza Santa Ana and Calle Prado (across the street from our hotel, Roommate Alicia) – we had a great, relaxed Sunday night here. 4. Art, art and more art – man, Madrid is overflowing with it! From the Prado to the Thyssen-Bornemisza to the Reina Sofia (contemporary art), you’ve got all your Spanish old masters (Velasquez, El Greco – eek, I don’t like his stuff, too ghosty-depressing looking – Goya, Ribera) plus Picasso and more! Space it out though, so you don’t get overwhelmed. 5. 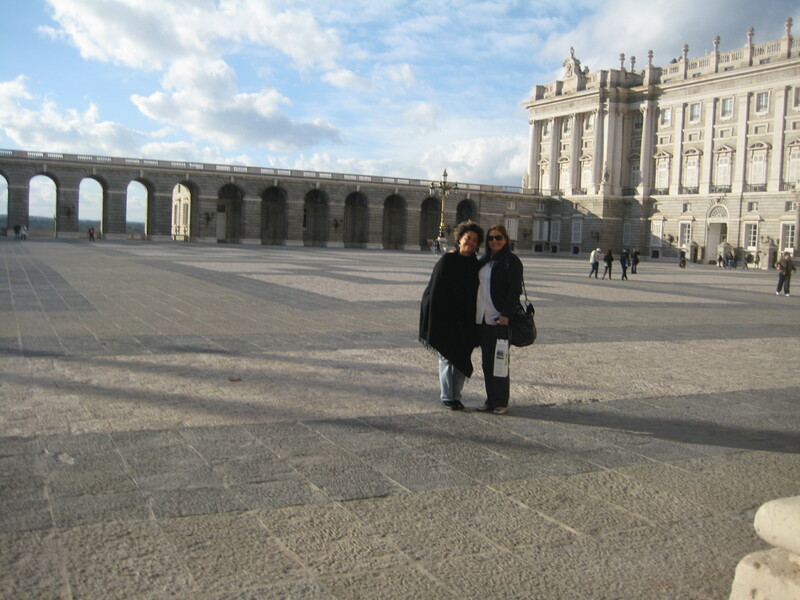 The Palacio Real – whoa! The royal palace blew us all away. I’d go so far as to put it on the same level of awe and interest as Versailles. It’s really well kept-up (the Spanish royal family still uses it for official events and what-not) and the audio tour is really interesting. There is a music room in that palace stuffed with half a dozen Stradivarious violins, violas and cellos, for cry eye! Amazing – totally worth it. 6. 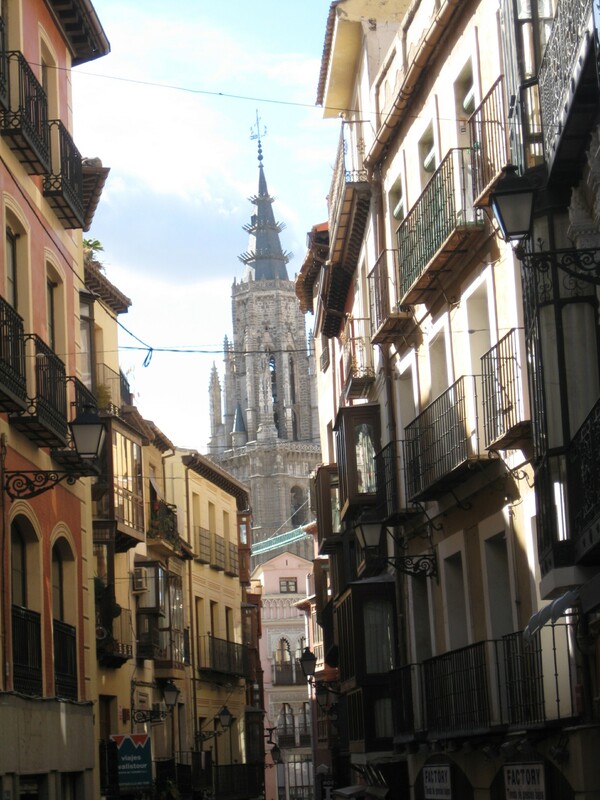 Toledo – it’s a 30-minute train trip to this cute, historic town. Handy tip: when you leave the train station in Toledo, head to your right, through the parking lot to the sidewalk – keep walking and you’ll see a bus stop. Bus No. 5 will come (1 Euro) and take you up to the town. You CAN walk but it is a lot of up-hill. We did walk down – there is a massive series of escalators that get you part-way down and then it’s a nice 15-minute walk back to the train station. The Cathedral is the big draw here, as well as the old fortress (which we never did get to.) The main plaza is charming, great place to stop for a coffee or glass of wine. Just meander the streets, check out the shops – you can do the whole town in 4 to 5 hours. 7. Mercado San Miguel – this indoor food market designed by Gustave Eiffel (pre Eiffel Tower) is all restored and re-done and great fun. Locals are there stocking up on fresh fish, cheeses, ham (of course), dried beans, olive oil, etc., and sharing tapas with friends. Amazing hot chocolate and churros was only 2 Euros. 9. HOLD ON TO YOUR PURSE! My friend’s wallet was plucked out of her zipped and snapped backpack, which she was wearing on her side (not her back, per se) and she didn’t feel a thing. Apparently, Madrid is a real hot-bed for pick-pocketing, so BE AWARE. 10. WATCH OUT FOR CONSTRUCTION – My God, I’ve never seen so much construction in a city – whole boulevards and neighborhoods were shaking with jackhammers and back-hoes – kind of ruined some nice walking routes, so just know – you might have to reconnoiter to avoid. Other than that – Madrid was a perfect five-day get-away with friends – good food, great history, awesome art and a relaxed vibe. Wonderful time – now I just have to return to get to Granada, Seville, Barcelona and the Costa del Sol! Viva Espagne, viva la ham! So I breathed a sigh of relief after I lifted my ridiculous and not-very-well-thought-out 1-year deadline for the Around the World in 80 Meals Project. This is me trying to eat 80 ethnic meals in and around the greater Chicago area. Why? Because I love traveling, hence, I love ethnic food – duh. If done in a year, that would mean 6.6 ethnic meals per month – not even I can accomplish that. Plus – why a year? Right? So – if it takes 18 months, or even two years, so be it! I added a new one on Friday night, at Sunshine Cafe, a tiny little family-run Japanese spot at 5449 N. Clark St. in Chicago (no web site). It’s BYOB and they’re only open until 9 p.m. The ambience is nothing to write home about, but the food is solid Japanese home cooking. Think sukiyaki (which I think I last had in about 1974), shrimp and veg tempura and grilled fish dishes. Along with tiny, delish shrimp dumplings and cold seaweed salad, they pour endless amounts of good green tea. I liked it! It was a cold, raw October night (way colder than it is supposed to be!) and it was definitely sukiyaki weather. The cast iron pan of hot, salty, sweet broth had thin slices of beef, tofu, bok choy and maybe some seaweed and what not and when added to the v. good Japanese white rice, it was the perfect Japanese comfort food for a Friday night with good friends. Sukiyaky at Sunshine Cafe fills the belly and the soul on a cold Chicago Friday night. Istanbul is a massive city of about 13 million, but for your first trip, it’s a good idea to base yourself in the small old neighborhood of Sultanahmet. Home to the Blue Mosque, the Hagia Sophia (pronounced “Aya Sophia,” not “hagia,” please), Topkapi Palace, the Cisterns and the Grand Bazaar. 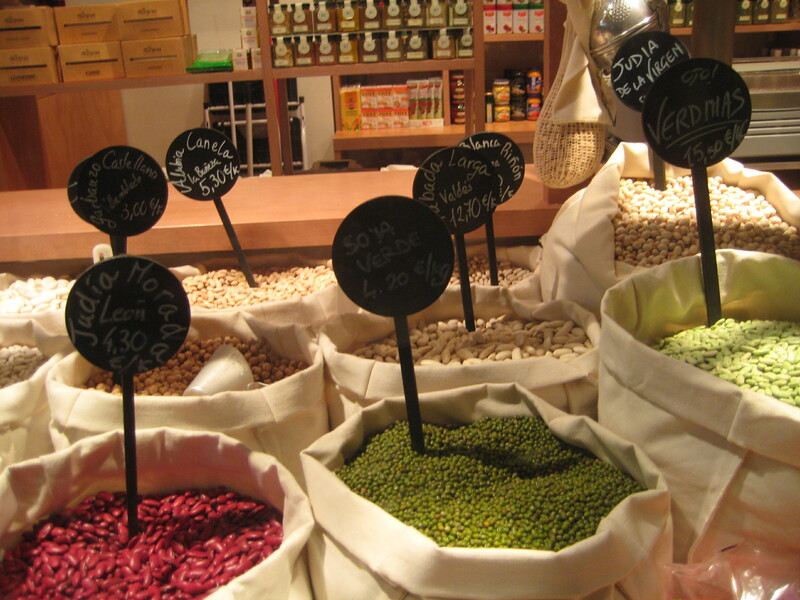 The only thing out of the ‘hood, which still pains me that I missed is the Egyptian Spice Market. Oh, well, I’ll be back. Katy and I checked into the Mavi Ev Hotel (also known as the Blue House Hotel), and I’m happy to say I can strongly recommend it as a great base for a stay in Istanbul. The staff was welcoming and friendly, and ambiance was authentic and charming and the rooms – while a tad small – are nicely decorated and have all the amenities you need, including a mini-bar, with complimentary bottled water (I drank only bottled water, per a friend’s suggestion, while there). Want to see the view we had, from our 3rd floor room? The Blue Mosque is less than 1 block away. Now – with a view like this comes another bonus: the call to prayer commences at 5:15 a.m., my friends, so bring your earplugs if you want to attempt to avoid it. I kind of liked it, though – it really makes you know you are in a far-away Muslim country. You get a reprieve from the clamor until about 1:15 p.m., and then you get it again at 5:15, 8:15 and 11:15 p.m. The muezzins broadcast on loud speaker, so no matter where you are in the city, you can be sure you won’t miss your prayer time. Praise Allah. Three “oohs and ahhs” = wow – I didn’t know that – this is really beautiful/important/cool! Four “oohs and ahhs” = holy moly, this is amazing! Five “oohs and ahhs” – Yow! You’ve GOT to see this! Maybe twice! Take pictures! I might skip shopping or even a meal to stay longer! Blue Mosque: 2-3 Oohs and Ahhs – it’s the beautiful blue tiles on the interior that make it such an attraction and it is the main mosque of Istanbul – the big daddy, so to speak, so it is important from a Muslim standpoint – but we didn’t spend more than 10 minutes inside. Hagia Sophia: 3 Oohs and Ahhs – it’s got great history, but it’s not much to look at now – was a mosque, then a Christian church, back to a mosque, now a museum. Good story behind it, but again, 10 minutes’ll do the trick here. Topkapi Palace: 4 Oohs and Ahhs – amazing history tied to the Ottoman Empire and the Sultans – it’s huge, but that empire was just not into the over-done, gilt-wrought stuff that makes your eyes go all googly – except for the jewels and royal gifts and what-not – ginormous emeralds and lots of shiny hammered gold. The grounds are pretty, but it’s no Versailles. Plan on a couple of hours here to see the stuff you’re most interested in (the jewels, the costumes – I wanted to see the kitchens badly, but they were closed the day we went, on a Sunday). The Cisterns: 4 Oohs and Aahs – for one, it’s cool – temperature cool – and it was smokin’ hot outside so it felt really good – plus which – it’s got history, they do it nicely for the tourists with lighting and atmospheric music and there are two Medusa-head pillars down there – on one, she’s sideways and another, she’s upside-down – no one knows how these came to be, so you get a good sense of mystery, too. The Grand Bazaar: 5 Oohs & Aahs – I mean, really: 4,000 shops under one roof? Get out. Yes, it can be a real tourist trap, but you’ve just got to know what you’re doing (luckily, both times I’ve been with an experienced shopper – a friend who lives in Istanbul). I was on the look-out this trip for the beautiful hand-painted ceramics – bowls, plates, tiles, but you will find everything in here – rugs, luggage, Turkish towels, jewelry, shoes, scarves ( pashminas – the real ones made of silk and cashmere – are about $6 or $7 U.S. and come in approximately 500 million colors and designs) – you name it. The trick is to figure out what you want to pay for something. Then ask: “What’s your best price?” The merchant will say something ridiculous (like the equivalent of $250 for a pair of embroidered flats). Then you counter and say what you want to pay – but go low, so you have room to go up a bit. It’s handy to have a little cheat sheet of Turkish Lira to your own currency (dollars for me), so you can be more confident in your negotiation. It’s actually fun, dickering back and forth with the merchants – you kind of get to know people a little bit. I love the Grand Bazaar, but my friend Katy couldn’t stomach it. Now – on to eating and drinking! Despite the Muslim-ness of Istanbul, these people know how to party. Rooftop cocktail lounges are the name of the game, as are waterside restaurants along the Bosphorus. Look how gorgeous! Both the people and the scene are gorgeous on the rooftop bars of Istanbul! The Narcissus: watermelon syrup, pomegranate juice or liqueur, lime juice, vodka – refreshing and just sweet enough. Another, please. The Moonshine: Limoncello, lemon juice, milk or cream and Kahlua – yes, sounds absolutely disgusting, but it was delicious! Katia and Mariza went ga-ga for this. Cactus Flower: Absolut vodka, cactus flower liqueur, cassis (raspberry liqueur), lime juice and fresh blueberries. As for food, I love Turkish cuisine. The hot and cold mezes (small plates) for starters can include hummus, mashed fava bean spread, ezme (a spicy mash-up of tomatoes, garlic and peppers) and these little fried roll-ups of phyllo-like dough filled with herbed white cheese (called “cigars” at many places). Manti – fresh handmade pasta filled with ground lamb and mint, with yogurt sauce and melted butter and more mint on top – are very rich, but so very good. And then you’ve got your kebabs – lamb is my favorite – and Kofte – little, flattened meatball-like delights spiced up with sumac, garlic and paprika. And you will find lots of whole roasted fish, really amazing white rice (what do they DO to it? Why is it so damn good? I’m currently on a mission to answer these burning questions.) And for dessert, you will see Baklava everywhere, but make a point to try some Turkish Delight – know as lokum to the natives – it’s chewy, sugary, full of pistachios, dusted in powdered sugar – one or two small pieces is a perfect end to a meal. Take one Turkish gulet (traditional wooden sailing ship), eight grown adults, a crew of three and a fully stocked pantry and bar and what to you have? The most amazing vacation ever, that’s what! I visited Turkey for the second time recently, heading straight for the southwest coast to board a chartered sailboat for a week with seven friends, including four Americans, a Croatian, an Azerbaijani, a Greek and a Russian. (We referred to ourselves as the United Nations on the Mediterranean.) If you are seeking relaxation, beautiful scenery, a bit of adventure and a lot of laughs, this is a trip you want to know more about. It all started by landing in Istanbul, and then connecting to Dalaman – about an hour’s flight – and then driving to the small port town of Gocek, where we spent the night. On Saturday morning, we awoke to perfect summer weather and a harbor bursting with gulets. The harbor in Gocek is where we boarded our boat, the Ercan. We found our crew (visit http://www.fethiyelife.com/bluecruise.html for the Turkish phone number of the Ercan to book) and boarded – then it was off to the Carrefour grocery store a couple of blocks away to stock up. The crew did all the food shopping, based on our direction (lots of fresh veg and fruit, fish, meat, etc.) while we ensured that our stock of adult beverages was adequate. After wiping out the entire section of rose’ and white wine, beer, mixers and other items, we pushed the carts to the boat (and returned them, of course!) and prepared to set sail. The Ercan has six cabins that each sleep two people, but at least half of us opted to sleep on-deck. The front of the boat features a slew of comfy cushions under a large canopy – all we needed to do was bring a bit of bedding up each night. The fresh air, the stars at night, the gentle lapping of water – and a pair of eyeshades to keep the sun from rudely awakening us at 5 a.m. – made for great sleeping. These same cushions became our day-time crashpad as well. Comfy cushions were a great crashpad for daytime lounging and nighttime sleeping. So here’s how our days went down: wake up (whenever you choose) and enjoy a delightful Turkish breakfast. The traditional breakfast is hard-boiled eggs, bread, sliced tomatoes, cucumbers, olives, white cheese – like Feta but softer – and coffee or tea; but you could ask for eggs any way, or maybe the pancake boat would make its rounds, where you can order fresh crepes filled with honey or Nutella! Yes! Right there, from a clever little boatman/pancake chef! Or the village bread boat would make a stop – ooh, that bread. I must add: vendor boats ply the waters all day, offering everything from newspapers to ice cream – fun, fun, fun! The rest of the day unfolds with such strenuous activities as lunch, more swimming, sailing, napping, reading, plates of watermelon, card games – whatever you like. We hit maybe three to four coves a day, finally dropping anchor for cocktails and the night’s stay wherever it looked nice. Just one of many gorgeous coves along the coast where we dropped anchor. * Consider going in June, when prices tend to be a bit lower and the weather is gorgeous – not too hot yet. You can book directly through a crew for the lowest price, or any good travel agent can book for you. * Bring a sarong – I used one as a bedsheet, a bath towel, a cover-up – a very handy item, I must say. * Bring more sunscreen than you think you need! That Turkish sun is powerful. While there is plenty of shade on the boat, when you’re swimming or otherwise in the sun, you will want sunscreen. * Buy a cheap beach towel in your port town ($5) and keep it to pack purchases from the Grand Bazaar in Istanbul! * Ask if your boat has noodles – those styrofoam floaty things – and if not, buy some in your port town ($2 each, or something like that). They’re fun to play with in the water — and a handy transport to get dry sneakers to shore, as mentioned. * Tell your boat crew about any food allergies, so they can stock up properly. * Bring lots of reading material, cards or travel versions of Scrabble, Backgammon, etc. for nighttime fun. * Bring an adaptor to recharge cameras and what-not. While the boat’s engine is on, you can plug in to a power strip. * Be ready to relax and revel in doing nothing but hanging out with good friends in a beautiful place! I am happy to answer any questions – post a comment if you have any! I cannot recommend this trip highly enough for fun, relaxation and a complete get-away! They don’t call it the Turquoise Coast for nothing. As I prepare my packing list for a 12-day Turkish odyssey later this month, I thought I’d share some of my favorite must-haves. I’ll be on a sailboat for a week, so can take a small suitcase. When it comes to suitcases, my favorite is Victorinox / Swiss Army brand. Colorful and sturdy, my trusty 24-inch Swiss Army suitcase goes around the world with me with the greatest of ease. Handy, nylon zippy bags from Le Sportsac are a travel necessity in my book. I LOVE this clever little number - tiny, functional and you get a mirror to boot! You can get these at Sephora or drug stories – but they’re a life saver, especially when you’re on-the-go. And they’re less than $10, to boot! And I always remember to pack a collapsible duffle for shopping. I cannot tell you how these have saved my life! You just don’t have to worry about whether or not the entire set of nesting bowls from the cermics shop in Guadalajara will fit into your suitcase! You are prepared with a roomy extra bag! So, hope these are helpful shares. I leave tonight and will be back blogging about te Turkish Blue Cruise upon my return.